There are several advantages to converting a 401k to silver, and the process is actually very easy. Whether you’re getting closer to retirement, or you’re planning decades ahead, investing in a precious metals IRA could provide better protection of your savings while helping you reach your retirement goals. Below, you’ll discover some of the unique benefits of converting your assets into silver or other precious metals, and how to go about it. Like any type of investment, there are specific strategies to purchasing silver, so you’ll want to speak with a precious metals advisor who can help identify the best course of action for your retirement accounts, based on your specific needs and goals. Why turn 401k to silver? Most employer-sponsored 401k plans offer very limited investment options. In many cases, you only have a list of 10 to 20 mutual funds and bonds to choose from – all paper assets that leave your retirement accounts exposed to the volatility of the stock market. While some employers may offer more options than others, in most cases you’ll be stuck with the same investments for as long as you stay employed by that company. Rollover a 401k into silver investments, however, and you can protect yourself from another significant stock market drop. When you convert a 401k to silver, you are diversifying your portfolio, which is critical for retirement planning. You never want to put all your eggs in one basket. Otherwise, market decline could erase a sizable portion of your savings in a very short amount of time, forcing you to delay retirement indefinitely. In addition to protecting your money from stock market volatility, you can also safeguard it against the declining dollar. With continued economic instability around the world, there is still a lot of uncertainty surrounding the dollar. Investing in precious metals like silver and gold can be a smart way to preserve your worth into the future and hedge against inflation. Even though silver is considered a stable liquid asset, the growth potential makes it an even more attractive investment. 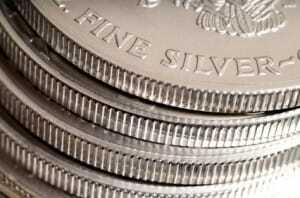 The value of silver has climbed considerably over the last decade, and the forecast is just as bullish. How can I rollover a 401k to silver? Converting an eligible 401k to silver is simple. Keep in mind, you do not actually add silver to 401k. Instead, you roll a 401k into silver by setting up an IRA. Here’s what you need to do to get started. An experienced precious metals company like Birch Gold Group can help you determine if a silver IRA is right for you. They will make suggestions based on your individual goals and will guide you through every step of the process. A silver-backed IRA gives you the option of rolling over some or all of your eligible 401k into physical silver possession. Your investment choices do not have to be 100% silver – you can diversify with other precious metals or paper assets. Your precious metals advisor will walk you through the process of converting your 401k and can even assist with the paperwork – essentially just a few basic forms to open your IRA and transfer the funds. Rated A+ by the Better Business Bureau, Birch Gold Group specializes in helping people convert their eligible 401k plans and IRAs into precious metals IRAs. We are happy to answer your questions and guide you through every step of the process. Simply call our knowledgeable advisors toll-free at (800)355-2116 or fill out the form on this page for additional free information.